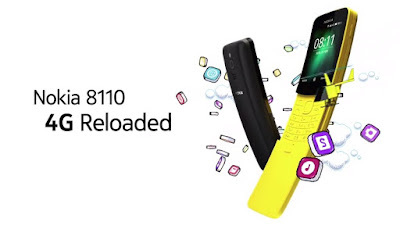 Nokia 8110 has support for Wi-Fi hotspot. powered by the Qualcomm Snapdragon 205 Dual-Core processor and comes with access to an app store with apps like Google Assistant, Google Search, Google Maps, Facebook, and Twitter, send and receive emails, import your contacts and sync your calendar with Outlook and Gmail. It also comes with a revamped version of Snake game. Connectivity options include 4G VoLTE, Wireless hotspot, Wi-Fi 802.11 b/g/n, Bluetooth 4.1, GPS, microUSB 2.0, 3.5mm audio jack, and support for OTA updates. A 1500mAh battery.